in both bootleg and authorized versions. our brief flash of success, and how it all fell apart. In the late 1960s, the music scene in Houston, Texas was exploding. We had Jimmie Vaughan and The Chessmen at the Catacombs; Johnny and Edgar Winter at Act III; Bubble Puppy, the 13th Floor Elevators and many others at a club called Love Street. Love Street Light Circus and Feelgood Machine featured live bands in front of a psychedelic light show. It was at the top of a 3-story building at Allen's Landing, a park on the north end of downtown. This was the closest thing we had in Houston to a Haight-Ashbury scene: music, head shops and hippies everywhere. It was a terrific atmosphere for young guitarists wanting to be Yardbirds. 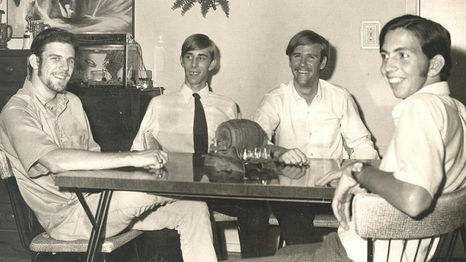 Three friends that would help shape the Josefus sound were still in high school together. They each played in a different band, but Ray Turner, Phillip White, and Dave Mitchell had frequent jams in southeast Houston. Some of these sessions were held at a house set way back from the street on Old Galveston Road, in the home of the 13th Floor Elevators. During high school, Ray and Dave did a few studio sessions in a group called Rip West. Two of those demos are on the Dead Man aLive CD. After graduation, Dave and Phillip formed a cover band that worked the clubs around Old Market Square and Allen's Landing, where they would share the stage with another group called The American Blues: Dusty Hill on bass, Frank Beard on drums, and Rocky Hill on guitar.